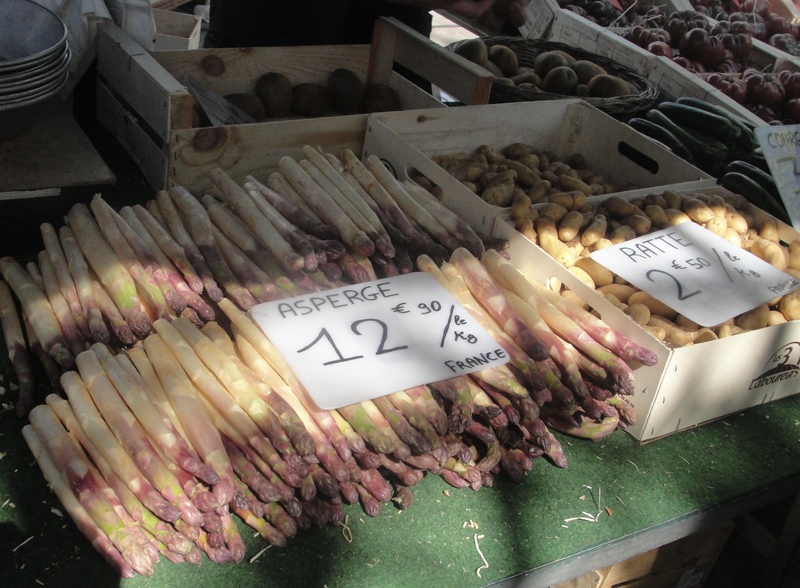 French Farmers Market – Gina Diamond's Flower Co.
It’s the moment for asparagus and both the green and white varieties are abundant. 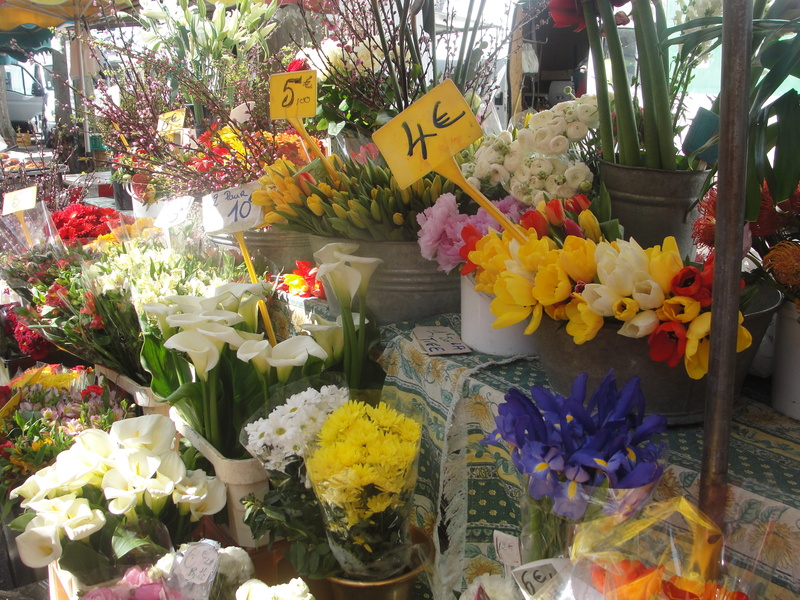 April 12, 2015, posted by Michelle – Just about every Sunday morning we go to the farmers market along the Saône river in downtown Lyon. 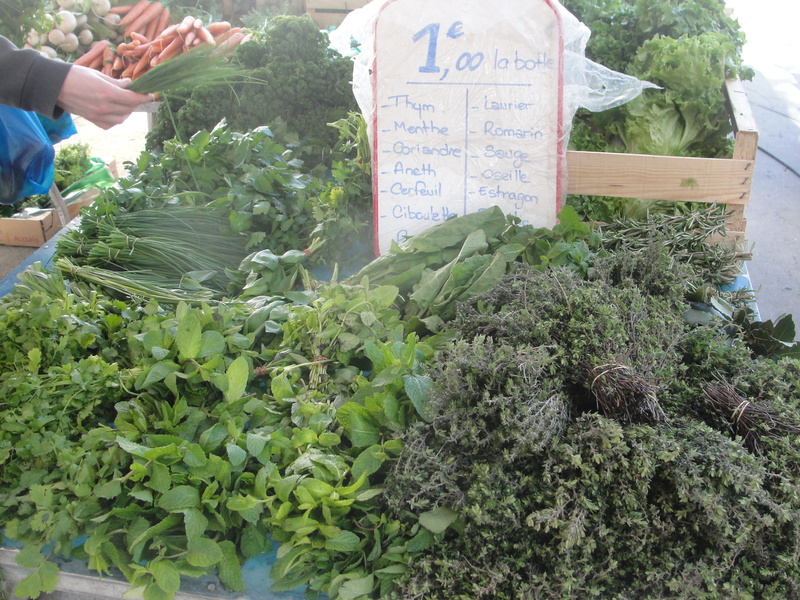 One of the great things about Lyon is that there are farmers markets all over town every day. In my neighborhood there’s a mini farmers market every Tuesday morning just 50 feet from where I live. But with over one hundred vendors nothing compares to the quarter mile of gastronomic paradise that is the Sunday market. The selection is huge, the quality supreme and the setting idyllic, especially on sunny Sundays. 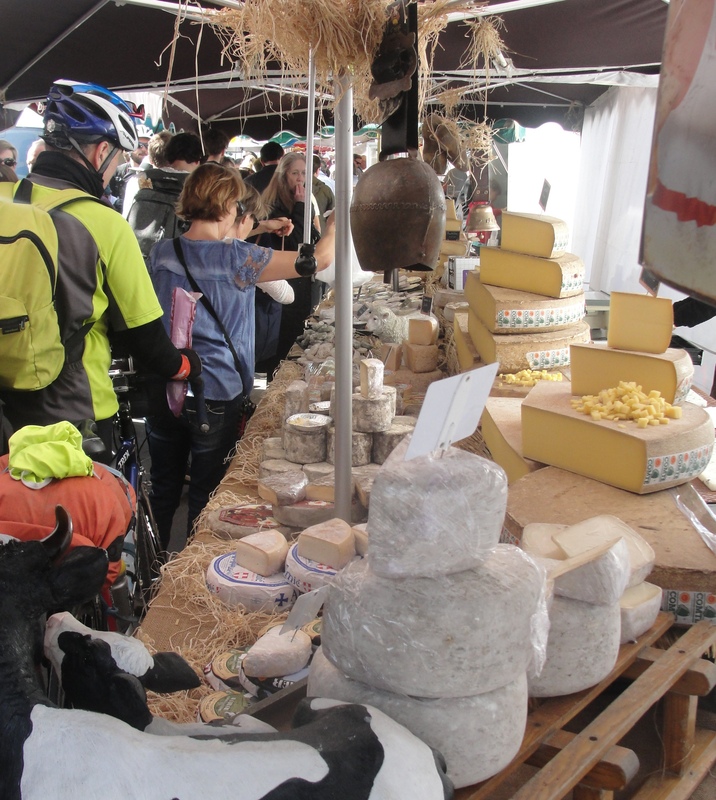 There’s plenty of local produce, cheese (oh, the cheese! 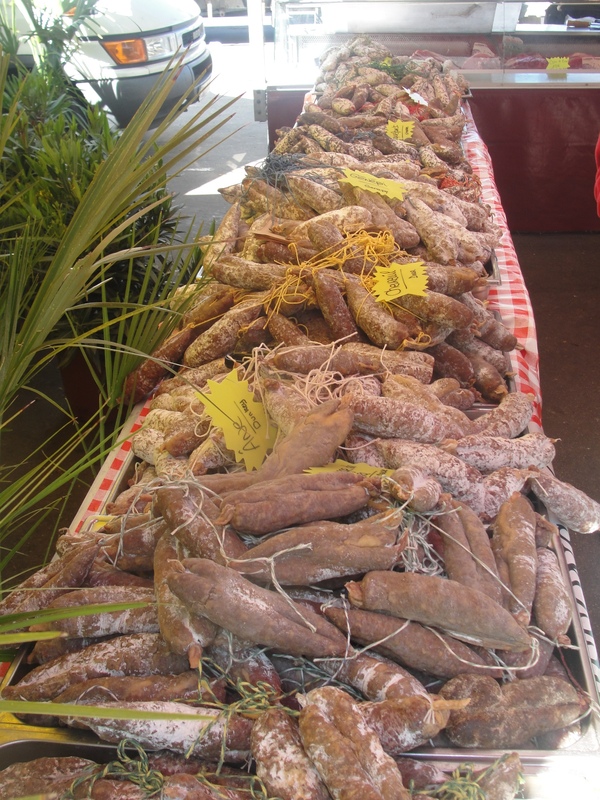 ), pastries, breads, herbs, honey, wine, fruit juices, ciders, seafood, meat, chicken, sausages, nuts, olives and flowers but also Italian, North African, Chinese and Latin American specialties. We have our favorite vendors to be sure; the lady who drives to Turin, Italy every weekend and returns with fresh pastas and parmesean, the cheese guy who has the disposition of a pitbull but his cheese is so good you gladly put up with him, Chez Carlos, the Chilean food truck that sells divine homemade empanadas with hot sauce, the herb people who sell big bunches of fresh herbs for almost nothing, the chicken producer we visit each week sells the tastiest chicken and we grab a bunch of fresh flowers from a sweet mother and daughter team. The market is a big social scene as well and the terraces of the two riverside cafés are packed, even in cold weather. 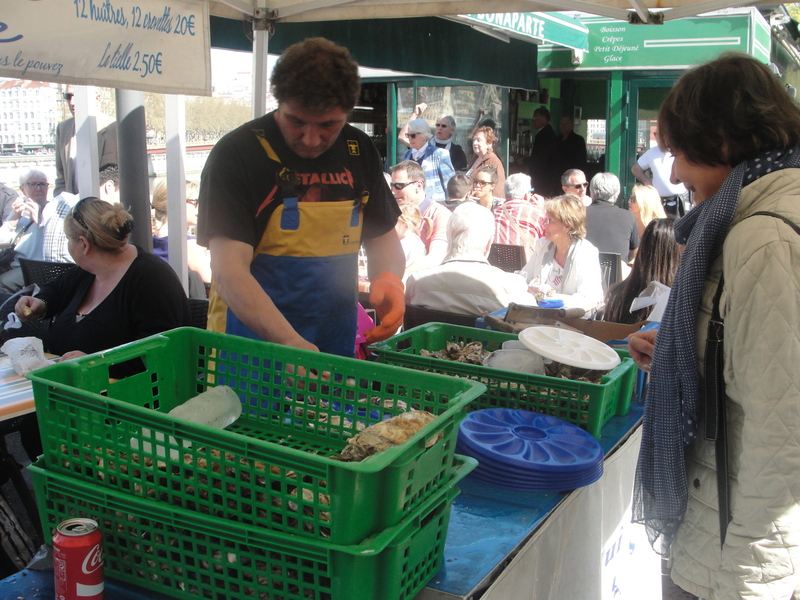 Their specialty is fresh oysters and each week the oyster guy is out there shucking them as fast as he can as a steady stream of oysters and white wine make their way to almost every table. 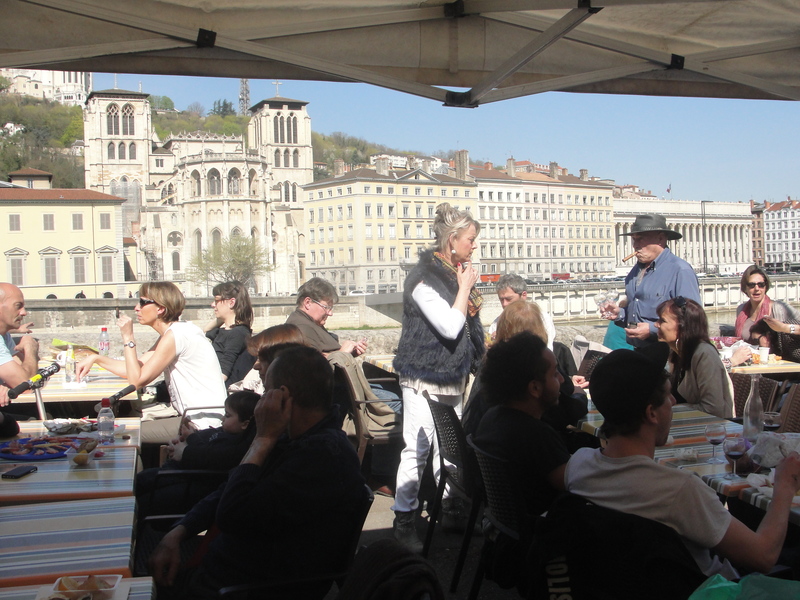 From these tables you have the perfect view of the market, the river and the two beautiful cathedrals and Renaissance buildings of Vieux-Lyon on the other side. Do you have a favorite farmers market? Are there certain foods you’ll only buy from a local farmer? We’d like to hear about your market days so if you’d like to leave a comment, click on the title of this post and the comment form will appear at the end of the post. Wow! That farmers market looks outstanding! I would love going there. I love buying tomatoes from the farmers market not far from my house. Also at the top of my list are squash and zuchinni. A few weeks ago I purchased the most delicious Loiusiana strawberries.